NEUTROGENA® ULTRA SHEER® Face & Body Stick Sunscreen SPF 50+ is an innovation in sun protection for your skin. It glides on easily, and its convenient, hands-free, no-mess application makes it great for travel. Formulated with HELIOPLEX® technology, it provides photostable, broad spectrum UVA/UVB protection combined with Dry-Touch technology to provide an ultra-light, non-greasy finish. This lightweight formula absorbs quickly and has a light, fresh scent. Apply generously and evenly 15 minutes before sun exposure. Reapply at least every 2 hours or after 80 minutes of swimming or sweating. Reapply immediately after towel drying. For use on children less than 6 months of age, consult a doctor. A nice product that works. Protection from the sun that really works. This sunscreen works well and doesn't irritate my skin. I use this product for my 6 year old who has severe eczema. This product is the only one I have found that does not cause stinging or a burning sensation for my 6 year old. I highly recommend using this!!! Also she can put it on her self with no mess!!! Fantastic product Neutrogena! Easy application! Great for having on hand for quick applications on the go. Works great! I m sensitive to the sun. Now this Neutrogena product is great ...so dependable! I love this sunscreen stick. This is my third year using this product, in fact, bought one for each my kids to take to school this year. During the day, they apply it on themselves before recess and lunch hour. Moms don't have to worry about messy applications, and accidentally getting liquid sunscreen in their kids eyes or even around their lips. Before this stick, applying sunscreen was such a hassle. The spray ons don't help either as they get to areas you don't want covered. love that you don't need to put it all over your hands. It is a mess free applicator that gives amazing protection and no need to re apply all the time either! 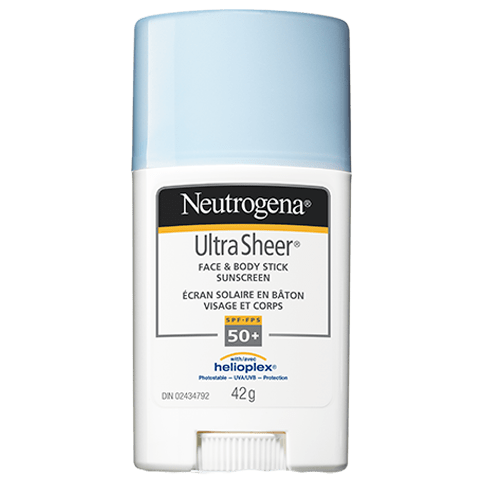 NEUTROGENA® ULTRA SHEER® FACE & BODY Sunscreen Stick SPF 50+, great idea, love this, so easy to use. It glides on easily, and its convenient, hands-free, no-mess application. The Dry-Touch technology to provide an ultra-light, non-greasy finish, love it.